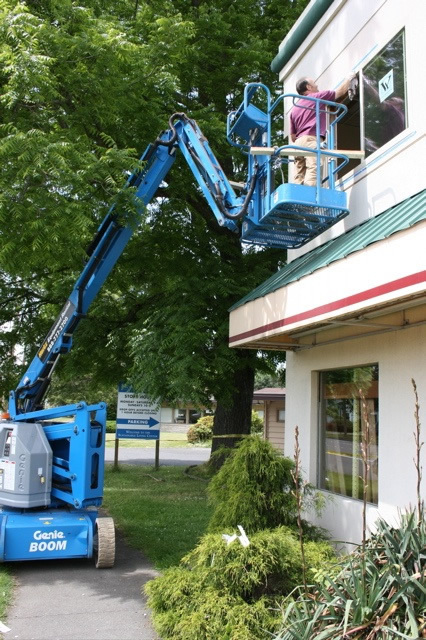 This project involved helping the local environmental organization RE Sources get moved into their new offices attached to the new location of the RE Store at 2309 Meridian Street in Bellingham. You can find out about the organizations at re-sources.org and re-store.org. I've also put together an Early History of the RE Store. 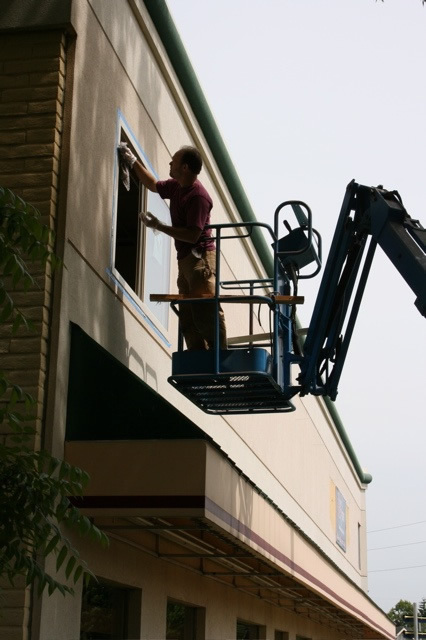 My work in moving the RE Store involved two phases – installing a suspended ceiling system throughout the office space, and installing new windows all along the blank upper floors of the street façade. 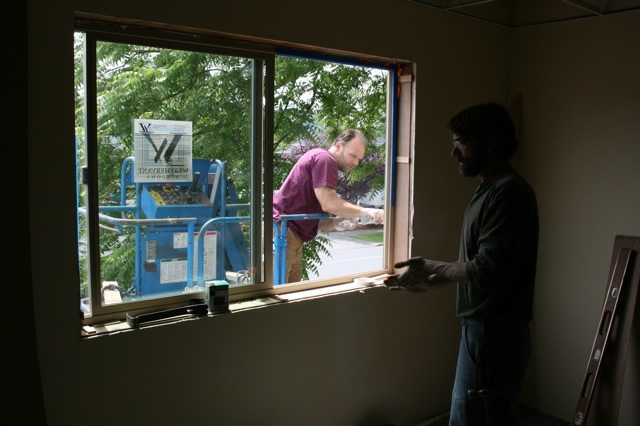 These pictures show the window project day in action. The first step was to cut through the multilayered skin of the building in precise locations for each window. A lift had been rented for the day to facilitate the work. Controls to maneuver the arm of the lift, as well as drive the whole vehicle around, were located up in the basket. With care the entire piece of equipment could be controlled just by myself up in the work position. The windows used came from RE Store salvage stock, but fit in with the existing building extremely well. 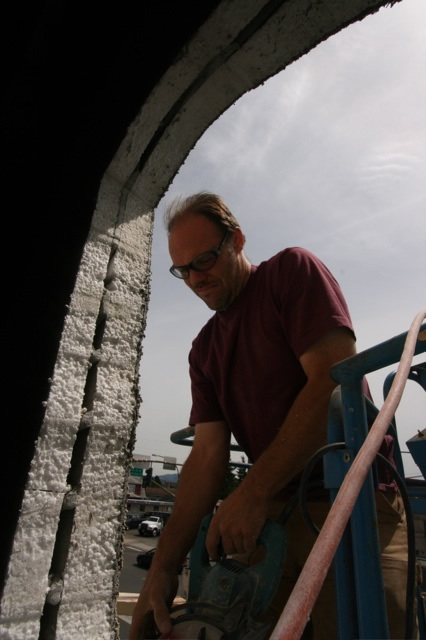 They were a type of window designed to be caulked into place, with no fasteners – ideal for the situation, where the building skin was made of synthetic stucco and foam insulation. Here I am carefully tooling the caulk around a window. The blue painters tape, which is low-adhesion and can be easily lifted away, is being used to help maintain a neat line for the excessive amount of caulk used to bed the window securely into place. Having a worker inside assisting with each window was essential for the process. 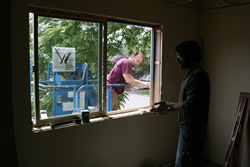 Here the RE Store’s Jeff Mason, the store’s primary carpenter, assists by using shims to level the window. The RE Store has a number of employees skilled enough to run entire phases of construction. The whole move to the new location, including significant upgrades and remodeling to the building, was accomplished almost completely with in-house labor and volunteer help.